Protection of members of Trust. Duty of Trust to declare and publish list of monuments. Designation of protected national heritage. Owner of national monument or protected national heritage not to alter without approval. Gifts, devise or bequest of protected national heritage or national monument to Trust. Effect of and compensation for preservation notices. Trust may grant permission for development works. Power of Trust to enter on lands. Exemption from stamp duties, taxes, etc. Treatment of amount spent by owner of protected national heritage for purposes of income tax. Capital allowances in respect of national monument. Amendment of Institute of Jamaica Act. 28th day of May 1985. AN ACT to Repeal and replace the Jamaica National Trust Act, to change the name of the Jamaica National Trust, and to make new provisions for the operation of the Trust and to provide for matters incidental thereto or connected therewith. This Act may be cited as the Jamaica National Heritage Trust Act, 1985, and shall come into operation on a day to be appointed by the Minister by notice published in the Gazette. any place or object (not declared by the Trust to be a national monument), designated by the Trust to be a protected national heritage; "the Trust" means the Jamaica National Heritage Trust established under section 3. Subject to any relevant international Convention to which Jamaica is a party the Minister may by order declare any area of the sea defined in the order, not being an area included in the territorial sea of Jamaica or its continental shelf, to be within the sovereign jurisdiction of Jamaica for the purposes of this Act. Nothing in subsection (2) shall be construed as limiting in any way the sovereign rights of Jamaica under general international law including the United Nations Convention on the Law of the Sea. There shall be established a Trust to be known as the Jamaica National Heritage Trust which shall be a body corporate with perpetual succession and a common seal and with power to purchase, hold, deal with and dispose of land and other property whether real or personal: Provided that the Trust shall not transfer, mortgage charge or dispose of any land without the approval of the Minister. seven members shall be appointed by the Minister from among persons appearing to the Minister to be suitably qualified for such appointment. The appointment of every member of the Trust other than the ex officio members shall be evidenced by instrument in writing, and such instrument shall state the period of office of the member which shall not exceed three years. Every member of the Trust shall be eligible for reappointment. The Minister shall appoint one of the members of the Trust to be chairman, and in the case of the absence or inability to act of the chairman the Minister may appoint any other member to perform the function of the chairman. The seal of the Trust shall be authenticated by the signatures of the chairman and any other one member of the Trust authorized to act in that behalf and such seal shall be officially and judicially noticed. All documents, other than those required by law to be under seal, made by, and all decisions of, the Trust may be signified under the hand of the chairman or any other member of the Trust authorized in that behalf. The Trust may sue and be sued in its corporate name and may for all purposes be described by such name. No act or proceeding of the Trust shall be questioned on account of any vacancy in the membership there-of; and no defect in the appointment of any member of the Trust shall vitiate any proceedings thereof. The Trust shall have power to regulate its own proceedings. The chairman shall preside at meetings of the Trust, and if the chairman and the person appointed to perform the function of chairman pursuant to subsection (5) are absent from a meeting the members of the Trust present shall elect one of their number to preside at the meeting. The names of all members of the Trust as first constituted and every change in the membership thereof shall be published in the Gazette. to conduct such research as it thinks necessary or desirable for the purposes of the performance of its functions under this Act; . to record any precious objects or works of art to be preserved and to identify and record any species of botanical or animal life to be protected. The Trust shall, for the purposes of the discharge of its functions under subsection (1) (d), keep a register which shall be open for inspection by the public upon payment of such fee as may be prescribed. For the purpose of the discharge of its functions under this Act the Trust may, subject to the provisions of this Act, do anything and enter into any transaction which, in the opinion of the Trust, is necessary to ensure the proper performance of its functions and, without prejudice to the generality of the foregoing, may make such grants or loans (whether with or without security) as the Trust considers necessary. all other sums or property which may in any manner become payable to or vested in the Trust in respect of any matter incidental to its powers and duties. The expenses of the Trust (including any remuneration of the members and staff thereof) shall be paid out of the funds and resources of the Trust. Travelling expenses actually incurred by members of the Trust and a subsistence allowance when attending meetings of the Trust or when travelling on official tours of inspection approved by the Trust may be reimbursed from the funds of the Trust. The rates of travelling allowance and subsistence allowance shall be such rates as the Minister may approve. The Trust may with the approval of the Minister enter into arrangements with any member of the Trust for the payment of an allowance to such member for giving technical advice on or for supervising repairs to or preserving or treating national monuments or protected national heritage. Subject to the provisions of this section, the Trust may borrow sums required by it for meeting any of its obligations or discharging any of its functions. The power of the Trust to borrow shall be exercisable only with the approval of the Minister responsible for finance, as to the amount, as to the sources of the borrowing and as to the terms on which the borrowing may be effected, and an approval given in any respect for the purposes of this subsection may be either general or limited to a particular borrowing or otherwise, and may be either unconditional or subject to conditions. The Trust shall keep proper accounts and other records in relation to the business of the Trust and shall prepare annually a statement of accounts in a form satisfactory to the Minister, being a form which shall conform with best commercial standards. The accounts of the Trust shall be audited annually under such arrangements and in such manner as may be approved by the Auditor-General and the members, officers and servants of the Trust shall grant to the person conducting such audit access to all the books, documents, cash and securities of the Trust and shall give to him on request all such information as shall be within their knowledge in relation to the operation of the Trust. The auditor's fees and any expenses of the audit shall be paid by the Trust. Within three months after the expiration of each financial year or within such further time as may be allowed by the Minister, the Trust shall send the statement of its accounts referred to in subsection (1) to the Minister, together with a copy of any report made by the auditor on that statement and on the accounts of the Trust. The Auditor-General shall be entitled, on the direction of the Minister, at all reasonable times to examine the accounts and other records in relation to the business of the Trust. The Trust shall, within three months after the expiration of each financial year or within such further time as may be allowed by the Minister, cause to be made and transmitted to the Minister a report dealing generally with the activities of the Trust during that financial year. The Minister shall cause a copy of the report together with the annual statement of accounts and the auditor's report thereon and on the accounts to be laid on the Table of the House of Representatives and of the Senate. no appointment shall be made to any post to which a salary in excess of the prescribed rate is assigned without the prior approval of the Minister. In subsection (1) the prescribed rate means a rate of fifteen thousand dollars per annum or such higher rate as the Minister may, by order, prescribe. The Governor-General may, subject to such conditions as he may impose, approve the appointment of any officer in the service of the Government to any office with the Trust and any officer so appointed shall, while so employed, in relation to any pension, gratuity or other allowance, and in relation to other rights as a public officer, be treated as continuing in the service of the Government. to make regulations, for pensions, gratuities and other retiring or disability or death benefits relating to members and employees of the Trust and such arrangements or regulations may include provisions for the grant of benefits to the dependants and the legal personal representatives of such members or employees. No action, suit or other proceedings shall be brought or instituted personally against any member of the Trust in respect of any act done bona fide in pursuance or execution or intended execution of this Act. Where any member of the Trust is exempt from liability by reason only of the provisions of this section the Trust shall be liable to the extent that they would be if the said member was a servant or agent of the Trust. The Trust may in accordance with the First Schedule from time to time declare to be a national monument any structure the preservation of which is, in the opinion of the Trust, a matter of public interest by reason of the historic, architectural, traditional, artistic, aesthetic, scientific or archaeological interest attaching thereto. The Trust shall, in each year, cause to be published in the Gazette a list (hereinafter referred to as "the list") of all national monuments in the Island for the time being declared by the Trust pursuant to subsection (1). The Trust shall cause to be placed on a conspicuous part of each national monument included in the list a mark identifying the monument. Where any structure is declared a national monument the Trust shall notify the Registrar of Titles of any registered titles known to the Trust to be affected by the declaration and shall cause a copy of the declaration to be served on the Registrar of Titles who shall forthwith note on those registered titles the fact of the declaration having been made. The Trust shall notify the Deputy Keeper of the Records of any national monument the title to which is not under the Registration of Titles Act. In this section and in sections 19 and 20 structure includes any building, structure, object or other work of man or nature whether above or below the surface of the land or the floor of the sea within the territorial waters of the Island, or any area declared in any order made under section 2 (2) to be within the maritime resource jurisdiction, and any site, cave or excavation. in the case of any moveable objects- (1) notify the owner thereof of the designation of the object as protected national heritage and the time and manner in which the owner may object to such designation; (ii) publish annually in a daily newspaper published in the Island a list of such objects. The provision of the first schedule shall mutatis mutandis apply to any objections made to the designation of any object referred to in subsection (2) (c). a protected national heritage designated as such pursuant to section 13 (1), suffer, financial loss (whether actual or by diminution in value) as a result of such declaration or designation, such owner shall be entitled to receive such compensation as may be appropriate in the circumstance. The provisions of subsection (3) of section 20 shall, mutatis mutandis, apply to compensation under this section. to maintain the protected national heritage or national monument. a protected national heritage shall not demolish, remove or alter it without the prior written approval of the Trust. Any owner of a national monument or protected national heritage who contravenes subsection (1) shall be guilty of an offence and shall be liable on summary conviction before a Resident Magistrate to a fine not exceeding twenty thousand dollars or to imprisonment for a term not exceeding two years or to both such fine and imprisonment and in addition, the Court may order him to pay the costs of restoring such monument or protected national heritage and in default of payment of such costs, he may be imprisoned for a term not exceeding twelve months. 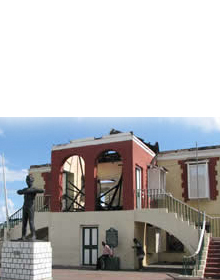 removes any national monument or protected national heritage to a place outside of Jamaica or causes it to be so removed, shall be guilty of an offence and on summary conviction before a Resident Magistrate be liable to a fine not exceeding forty thousand dollars or to imprisonment for a term not exceeding two years or to both such fine and imprisonment, and in addition, such person may be ordered to pay the cost of replacement of any such monument, mark or notice and in default of payment of such cost, to be imprisoned with hard labour for a further term not exceeding twelve months. Any person may, by deed or will, give, devise, or bequeath to the Trust all such estate or interest in any protected national heritage or any national monument as he may be seized or possessed of, and the Trust may accept such gift, devise or bequest if it thinks it expedient to do so. 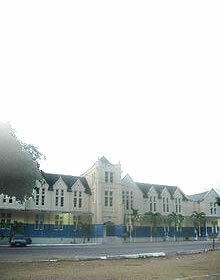 that it is in danger of destruction or removal or damage from neglect of injudicious treatment, the Minister may, upon the advice of the Trust, serve a notice (in this Act referred to as a "preservation notice") on the owner and, if the owner is not the occupier, on the occupier of the structure, stating that it will be under the protection of the Minister under this Act while the notice is in force. Where the Minister serves a preservation notice he shall specify the period (not exceeding six months) during which the notice is to remain in force and shall cause a copy thereof to be fixed on some conspicuous part of the structure. Where a notice is served under subsection (1), the Trust may, by written authorization signed on its behalf by a member of the Trust, authorize any person (including a member of the Trust) to inspect the structure, and any person so authorized may at reasonable time, on production by him of the authorization if so required, enter any premises for the purpose of inspecting the structure: Provided that, unless the Trust considers that the inspection of the structure is a matter of urgent necessity, it shall give reasonable notice in writing of the proposed inspection to the occupier of the premises which are to be entered. upon being satisfied on written representations made by the owner that such owner is likely to suffer financial loss if the notice is not revoked. While a preservation notice is in force with respect to any structure, that structure shall not be demolished or removed, nor shall any additions or alterations be made thereto or any work carried out in connection thereon with, except with the written consent of the Minister granted either unconditionally or subject to such conditions as the Minister may think fit. Where a person has an interest in the whole or a part of any structure and he suffers financial loss or incurs expenditure in respect of that interest in consequence of the refusal, or the granting subject to conditions, of any consent requited under subsection (1), he shall be entitled to receive such compensation as may be appropriate in the circumstances. Any question as to a person's right to compensation under subsection (2), or as to the amount of any such compensation which is appropriate in the circumstances shall in default of agreement be determined by the Resident Magistrate in the manner provided in the Lands Clauses Act for settling cases of disputed compensation, and in constructing that Act for the purpose of this Act, this Act shall be deemed to be the special Statute and the Trust shall be deemed to be the promoters of the undertaking. Any person who contravenes the provisions of subsection (1) shall be guilty of an offence and shall be liable on summary conviction before a Resident Magistrate to a fine not exceeding forty thousand dollars or to imprisonment for a term not exceeding two years or to both such fine and imprisonment and, in addition, may be ordered by the court by whom he is tried to pay such sum as the Court thinks just for the purpose of repairing or restoring the monument. While a preservation notice is in force the Trust may with a view to the maintenance of the structure to which it relates, have access by itself, its inspectors, agents or workmen to such structure for the purpose of inspecting it and of bringing such materials and doing such acts and things as may be required for the maintenance thereof. For the purpose of preserving the amenities of any national monument, or any place designated to be a protected national heritage, the Trust may, subject to the provisions of this section, prepare and confirm a scheme (hereafter in this Act referred to as a "preservation scheme") for any area comprising or adjacent to the site of the monument or the place aforesaid, being an area to which, in the opinion of the Trust, it is necessary or expedient for that purpose that the scheme should apply. for such other matters as appear to the Trust to be incidental to or consequential on the foregoing pro- visions of this section or to be necessary for giving effect to those provisions. The provisions of the Second Schedule shall have effect with respect to the confirmation, variation and revocation, of preservation schemes. if and so far as its construction, erection or execution was necessary for the purpose of performing a contract made before that date. Any person whose property is injuriously affected by the coming into force of a preservation scheme shall be entitled to obtain compensation in respect thereof from the Trust subject to the provisions of the Third Schedule. If any person contravenes any provision of a preservation scheme for the time being in force, he shall be liable on summary conviction before a Resident Magistrate to a fine not exceeding five hundred dollars for every day on which the contravention occurs or continues. If, after any person has been convicted of a contravention of a preservation scheme by reason that any building, structure or other work is not in conformity with the scheme, the contravention continues after the expiration of such period as the Court before whom he was convicted may determine, the Trust shall have power to do all such acts as, in its opinion, are necessary for removing so much of the building, structure or work as is not in conformity with the scheme, or for making it conform with the scheme, and any expenses incurred by the Trust in so doing shall be recoverable in a Resident Magistrate's Court as a civil debt from the person convicted. The owner of any national monument who intends to carry out any development works in relation to that monument shall, before commencing such work, apply to the Trust for permission, giving details of the proposed works. The Trust may, upon receipt of such application as aforesaid, grant permission for the works specified therein to be carried out under the supervision of the Trust. For the purposes of this Act the expression "development works" includes the restoring, altering, repairing or excavating of a monument or demolishing of any part thereof and the doing of any act or thing which may be required for the purpose "of restoring, altering, repairing or excavating the monument. for the purpose of determining whether it should be declared a national monument. Where any person enters any land or building for the purpose of investigation, inspection or maintenance in accordance with subsection (1) he shall have power to do all such things as he considers necessary for the purpose of such investigation, inspection or maintenance, and, without prejudice to the generality of the foregoing, may make excavations on the land. the Trust is satisfied that the excavation forms part of the national monument. If any person wilfully obstructs or hinders any person duly authorized by the Trust in the exercise of the powers conferred by this section, he shall be liable on summary conviction before a Resident Magistrate to a fine not exceeding five thousand dollars. Every document required or authorized to be served under this Act upon the owner or occupier of a national monument may be served either by delivering it or leaving it at the usual or last-known place of abode of the person on whom it is to be served, or by sending it by post as a registered letter addressed to him at his last-known place of abode or, if that cannot, be found, by fixing it on some conspicuous part of the monument. Any such document may, as the case requires, be addressed to the "owner" or "occupier" of the monument (describing it) without further name or description. the Trust shall, in relation to all property whatsoever held or dealt with by them for the purpose of this Act, be exempt from the payment of property tax and income tax. For the purposes of section 13 of the Income Tax Act, any amount expended by the owner of a national monument or protected national heritage for the maintenance or development thereof and certified by the Trust as required for the preservation of the monument or protected national heritage shall be treated as expenses wholly and exclusively incurred in acquiring income. Notwithstanding anything to the contrary, where the owner of a national monument incurs capital expenditure in developing that monument, an allowance (in this section referred to as an "investment allowance") equal to seventy- five per centum of such capital expenditure shall, in lieu of an initial allowance or any other similar allowance under the Income Tax Act, be made to that owner for the year of assessment in the basis period for which such expenditure is incurred. the amount of an investment allowance shall not be written off in ascertaining the written down value of the national monument or taken into account for the purposes of sub-paragraph (4) of paragraph 3 of Part I of that Schedule. Provided that where income is derived from a national monument in any year, the investment allowance or annual allowance shall be claimed against that income in priority to any other income of the owner, and accordingly, the owner shall adopt such accounting procedures as are appropriate to identify the amount of investment allowance remaining to be written off. Subject to the provisions of this Act, where an investment allowance is made under this section in respect of machinery, the provisions of the First Schedule aforesaid or any other provisions of the Income Tax Act applicable to initial allowances granted pursuant to paragraph 1 of Part III of that Schedule shall apply with the necessary adaptations to the investment allowance made under this section as they apply to initial allowances aforesaid except that the amount of an investment allowance shall not be written off in ascertaining the written down value of the machinery or taken into account for the purposes of paragraph 3, paragraph 4 or paragraph 5 of Part III of that Schedule. Notwithstanding the provisions of paragraph 6 of Part I of the Schedule aforesaid, the making of an investment allowance pursuant to this section in respect of any expenditure shall not preclude the grant of annual allowances or balancing allowances in respect of that expenditure in accordance with the provisions of Part I of the Schedule aforesaid. sums expended for materials, equipment, machinery, plans and other items used in the development of the national monument. for prescribing anything required to be prescribed under this Act. 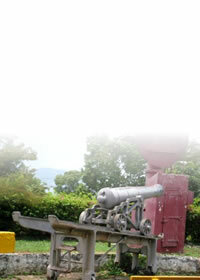 in relation to which the Jamaica National Trust Commission were constituted guardian pursuant to the replaced Act, and all interests, rights and easements into or out of the said property which belong to or are vested in the said Commission shall, without any conveyance, assignment or transfer, belong to and be vested in the Trust established under this Act, subject to all and any trusts and to all debts, liabilities and obligations affecting the same and of all enactments, or rules made under this Act or any enactment, regulating the management, maintenance, control, supervision and dealing with such property. by deleting paragraph (b) of subsection (I) of section 4. Provided that where an objection has been duly made as aforesaid and has been withdrawn, the Trust, unless it considers the objection to be frivolous or has modified the declaration as required by the objection, shall, before making the declaration, direct a public inquiry to be held as hereinafter provided and consider the report of the persons who held the enquiry. An inquiry under this Schedule shall be held in accordance with regulations made by the Minister for the purpose, and such regulations may contain provisions as to the cost of the inquiry. A copy of the report of the person who held the inquiry referred to in paragraph 2 shall be sent to any person who made an objection. Any person, being a person who has made an objection pursuant to paragraph 1 (d), who is aggrieved by the report referred to in sub-paragraph (1) or by the failure of the Trust to direct an inquiry to be held in accordance with paragraph 2 may, within (thirty) days after the date on which the objection was made or within (thirty) days after the receipt by him of a copy of the report as aforesaid, appeal to the Minister. (e) On the determination of an appeal by him the Minister may make such order as he thinks fit. As soon as may be after the declaration has been made, the Trust shall publish in the Gazette and in a daily newspaper published in Kingston a notice stating that the declaration has been made and the effect thereof, and shall serve a like notice and a copy of the declaration on every person on whom a copy of the draft declaration was required to be served under paragraph 1 and on any other person appearing to the Trust to have an interest in the national monument who duly made an objection which has not been withdrawn, and the declaration shall come into operation on the date on which the notice is published as aforesaid in the Gazette. The Trust shall also, as soon as may be after the declaration has been made, cause a copy of the declaration to be fixed on some conspicuous part of the national monument. Before confirming a preservation scheme (hereinafter in this Schedule referred to as a "scheme") the Trust shall cause to be published in the Gazette, and in such other manner as it thinks best for informing persons affected, notice of its intention to confirm the scheme, of the place where copies thereof maybe inspected, and of the time (which shall not be less than three months) within which and the manner in which representations with respect to the scheme may be made, and shall cause such notice as aforesaid to be given to every local authority in whose area any part of the controlled area is comprised. Any person affected by the scheme may, within the time appointed under paragraph 1 for making representations, send to the Trust written objection to the scheme stating the specific grounds of objection and the specific modifications required. a scheme as so confirmed shall not apply to any area to which it would not have applied if it had been confirmed without modification. A scheme when confirmed shall come into force on such date as may be specified in the order confirming it. As soon as may be after the making of an order under this Schedule, the order shall be published in the Gazette, and in such other manner as the Trust thinks best for informing persons affected, and a copy of the order be sent to every local authority in whose area any part of the controlled area comprised. A person shall not be entitled to compensation by reason of the fact that any act or thing done or caused to be done by him has been rendered abortive by a preservation scheme, if or so far as the act or thing done after the date on which the Trust published in the Gazette notice of its intention to confirm the scheme, or by reason of the fact that the performance of any contract made by him after that date is prohibited by the scheme. Where any provision of a preservation scheme was, immediately before the scheme came into force, already in force by virtue of this or any other enactment, no compensation shall be payable by reason of any financial loss (whether actual or by diminution in value) suffered as a result of that provision of the preservation scheme if compensation has been paid, or could have been claimed, or was not payable, by reason of the financial loss (whether actual or by diminution in value) having been suffered as a result of the provision already in force. if compensation would have been payable, the compensation payable in respect of that provision of the preservation scheme shall not be greater than the compensation which would have been payable. Any dispute as to whether any person suffered financial loss (whether actual or by diminution in value) as a result of a preservation scheme, or as to the amount of the sum which is to be paid as compensation in respect of such scheme, shall be determined by the Resident Magistrate in the manner provided in the Lands Clauses Act for settling cases of disputed compensation, and in construing that the Act for the purposes of this Act, this Act shall be deemed to be the special statue and the Trust shall be deemed to be the promoters of the undertaking.